You know him from the hit A&E show Duck Dynasty - now you can enjoy Uncle Si's tall tales, crazy exploits, and quirky one-liners in one raucous collection! "These hands are so fast, I can get your wallet before you know it. In a minute, you'll be standing there buck naked and won't know what hit you!" "Look here - if it wasn't for my tripped knee, I'd be playing in the NBA today." Any of these sound familiar? If they do - or even if they don't - you're in for a good laugh. The brother of patriarch Phil Robertson, Uncle Si has a limitless supply of stories about his childhood, duck hunting adventures, his days in Vietnam, and everything in between. Now the best of those tales are gathered into this roaring collection. Si shares stories of the more than 25 marriage proposals he's received in the mail (some with photos! ), how he came to use a green Tupperware cup for his ever-present sweet tea, and how his cigarette smoke made a deer cough (he's since quit smoking). And in many of these never-before-heard tales, Si openly talks about his wife and two children - who are never seen and rarely mentioned on the show. Si's one-liners are sure to please die-hard fans and curious newbies alike. In no time, this smattering of zany stories will have you falling over with laughter and retelling them to all your friends. 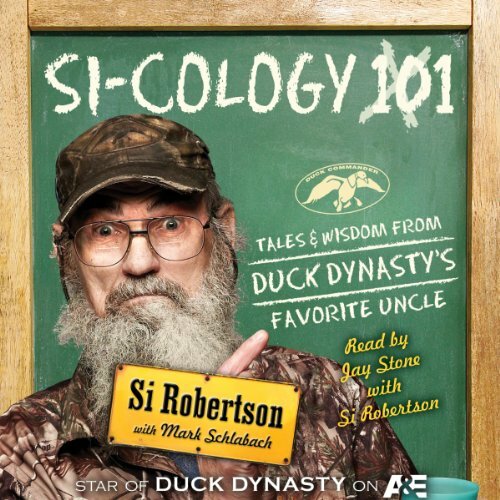 The Audible description says that Si Robertson is the narrator of this audio book. Si's voice is on the introduction or forward but his "nephew in law" narrated everything else. I'm certainly not going to criticize any of Si's family but I was looking forward to hearing Si's voice.Audible does need to correct the information about who actually narrated the book. Who would you have cast as narrator instead of Si Robertson? I would prefer that Si actually be narrator of the book. No one can replace him.Audible needs to correct the information on the description. Why? It is already on A&E. The program would have been better if Si had narrated the whole book rather than just the introduction or forward. He could have been promised a nap and fresh iced tea between chapters! PREACH SI! 6 out of 5 stars JACK! What did you love best about Si-cology 1? I really enjoyed how the story was laid out for the listener. Unlike other books of this nature that drag on endlessly until a conclusion that is beyond lackluster, in his book you can almost see whats going to happen, but at the same time the outcome (which you may already know) is viewed in an entirely different light. I also liked how this wasn't just a make it rich quick sell it why it's hot type book. It also lays out how Si isn't a character fabricated by a grad school producer. The obvious answer to most would be Si and he is high on my list, but his wife Christine sounds like an awesome woman who endured a lot physically, mentally, and emotionally. Her story was just as compelling in my ow opinion and the courage she showed in the face of adversity should be lesson for all. Have you listened to any of Si Robertson’s other performances before? How does this one compare? Well, I guess Duck Dynasty on TV would be the only other platform and this book is just as good. Take my word for it this book isn't about striking why the iron is hot. It's well written, well told, and well put together. Worth every cent jack! If you could sum up Si-cology 1 in three words, what would they be? We get to know the Si not seen on TV while his humor is still prevalant throughout the book. I was really looking forward to listening to 4 hours of Uncle Si spin his tale, 95% truthful, of course. That's not what I got. Uncle Si introduces the book, then turns it over to the most terrible narrator. I don't believe I have heard worse on any Audible book I've listened to. I was disappointed in this. If you can suffer through the narration, it's an enjoyable look into the life of Uncle Si...just wish he had narrated the whole book. I gave the book an overall rating of 4 stars because I'm a fan of the show and Uncle Si, but the narration was just terrible. Would you consider the audio edition of Si-cology 1 to be better than the print version? What about Si Robertson’s performance did you like? What was one of the most memorable moments of Si-cology 1? His stories of Vietnam--particularly the story of the missing engine. What didn’t you like about Si Robertson’s performance? The narrator did a good job. However, I would have appreciated Si reading the whole book--not just the opening and closing chapters. How can you NOT buy this book???? Yes, Si is so funny and heartfelt. Shoot birds when he was young. Don't delay buy this book and listen to it in one setting. This is hard because I love Si. I wanted to like his book but I just didn’t. Never really watched Duck Dynasty... got this book on recommendation from a friend. I normally listen to books about the Cold War, significant people from history, and industry, so I thought this book wouldn't be all that interesting. What I found is that this book is just plain fun to listen to! Si has some great stories and he's a pretty good story teller. Highly recommend, no matter what type of books you're in to!